The 2012 German Grand Prix, formally the Formula 1 Großer Preis Santander von Deutschland, was a Formula One motor race that took place on 22 July 2012 as the tenth round of the 2012 season. 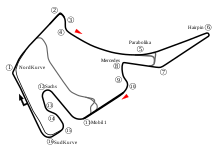 After being held at the Nürburgring in 2011, the race returned to the Hockenheimring in Baden-Württemberg, making the 2012 race the thirty-third time the circuit hosted the German Grand Prix, and the eighth time the shortened circuit hosted the race since its 2002 redesign. Ferrari driver Fernando Alonso started the 67-lap race from pole position and won the race. This race marks Lewis Hamilton's 100th race. As there was no race at Hockenheim in 2011, 2012 is the first year that the drag reduction system (DRS) and Pirelli tyres featured at the circuit. The DRS detection zone for the race was located at turn four, with the activation zone located 260 metres (850 ft) further down the road, so that it could be used on the approach to the hairpin. Tyre supplier Pirelli chose to run with the most commonly run tyre combination of the year to date, and brought its white-banded medium compound tyre as the harder "prime" tyre and the yellow-banded soft compound tyre as the softer "option" tyre to the Hockenheim circuit. Romain Grosjean took a five-place grid penalty after his team discovered a terminal issue in his gearbox. Nico Rosberg and Mark Webber were also given five-place penalties for gearbox changes. Sergio Pérez was given a five-place grid penalty for impeding Fernando Alonso and Kimi Räikkönen in the second qualifying session. Dani Clos took over Narain Karthikeyan's HRT during the first free practice session. Jules Bianchi replaced Paul di Resta at Force India, while Valtteri Bottas once again drove Bruno Senna's Williams for the same session. The conditions on the grid were dry and sunny before the race; the air temperature ranged between 20–21 °C (68–70 °F) and the track temperature was between 30–32 °C (86–90 °F). ^1 — Romain Grosjean, Nico Rosberg and Mark Webber were each demoted five places as a penalty for changing their gearboxes before the race. ^2 — Sergio Pérez was demoted five places as a penalty for impeding Fernando Alonso and Kimi Räikkönen in the second qualifying session. Fernando Alonso started the race from pole position and won. ^1 — Sebastian Vettel was given a 20 second post-race drive-through penalty for an illegal overtaking manoeuvre on Jenson Button on lap 66, dropping him from second to fifth. ^ a b "Formula 1 Großer Preis Santander von Deutschland 2012". Formula1.com. Formula One Management. Archived from the original on June 20, 2012. Retrieved 8 July 2012. ^ Collantine, Keith (7 December 2011). "United States Grand Prix remains on unchanged 2012 F1 calendar". F1 Fanatic. Keith Collantine. Retrieved 8 July 2012. ^ "World Motor Sport Council: 03/11/2010". fia.com. Fédération Internationale de l'Automobile. 3 November 2010. Archived from the original on 5 November 2010. Retrieved 8 July 2012. ^ a b "Formula 1 Großer Preis Santander von Deutschland — Provisional Results". Formula1.com. Formula One Management. 21 July 2012. Archived from the original on July 24, 2012. Retrieved 22 July 2012. ^ Vermeeren, Frances (17 July 2012). "One DRS zone for Hockenheim GP". GPnow.com. GPNow. Archived from the original on 2013-01-25. Retrieved 17 July 2012. ^ "Pirelli reveal tyre choices for final three rounds". Formula One. 16 October 2012. Archived from the original on September 29, 2013. Retrieved 18 February 2013. ^ a b Noble, Jonathan (13 July 2012). "Grosjean to take five-place grid penalty at Hockenheim after team discovers gearbox issue". Autosport. Haymarket Publications. Retrieved 13 July 2012. ^ a b Straw, Edd; Strang, Simon (20 July 2012). "Rosberg to get five-place grid penalty after gearbox change ahead of German GP". Autosport. Haymarket Publications. Retrieved 20 July 2012. ^ a b Straw, Edd (21 July 2012). "Red Bull's Mark Webber gets gearbox change penalty for German Grand Prix". Autosport. Haymarket Publications. Retrieved 21 July 2012. ^ a b Beer, Matt (21 July 2012). "Sergio Perez handed penalty for impeding during qualifying for the German Grand Prix". Autosport. Haymarket Publications. Retrieved 21 July 2012. ^ Elizalde, Pablo (16 July 2012). "Clos to replace Karthikeyan at HRT for opening session of the German Grand Prix". Autosport. Haymarket Publications. Retrieved 16 July 2012. ^ Elizalde, Pablo (17 July 2012). "Bianchi gets another practice outing with Force India in Germany". Autosport. Haymarket Publications. Retrieved 17 July 2012. ^ Creighton, Geoff; Hughes, Emlyn (22 July 2012). "As it happened: The German Grand Prix". Autosport. Haymarket Publications. Retrieved 30 December 2015. ^ Symonds, Pat (August 2012). "Race Debrief". F1 Racing. Haymarket Publications: 106–109. ISSN 1361-4487. ^ "FORMULA 1 GROSSER PREIS SANTANDER VON DEUTSCHLAND 2012". Formula One World Championship Limited. 22 July 2012. Archived from the original on July 24, 2012. Retrieved 22 July 2012. ^ "Vettel penalised for Button pass, drops from second to fifth in the German Grand Prix". Autosport. 22 July 2012. ^ a b "Germany 2012 - Championship • STATS F1". www.statsf1.com. Retrieved 31 January 2019. Wikimedia Commons has media related to 2012 German Grand Prix.